Each day we rose before dawn and the unrelenting desert heat to continue digging east of the monumental staircase. In the summer of 2007, after Professor Netzer had discovered the base of the mausoleum, I volunteered at the archaeological site at Herodium. Among seas of pottery shards, we dug up baseball-sized stones hurled by a Roman catapult (ballista). Scanning with a metal detector, we found tiny, encrusted bronze coins, from the period of the Great Revolt. We uncovered a few well-carved stones strewn about – an egg and dart pattern, two five-petaled flowers from a decorative frieze. The high-quality limestone is meleke, from the root “king”, is not local to the site; it had been brought to Herodium specially for the mausoleum. At Herodium last week, these pieces were not to be found. The first image at the entrance to the Herod exhibit at the Israel museum opening today is neither architecture or artifacts, but the Judean desert – the site where Herod built his monuments is important. Following Herod the Builder, museum staff re-constructed three rooms from Herod’s palaces at the museum. The first room you enter is a replica of the throne room from Herod’s third palace at Jericho, excavated by Netzer for his doctorate. 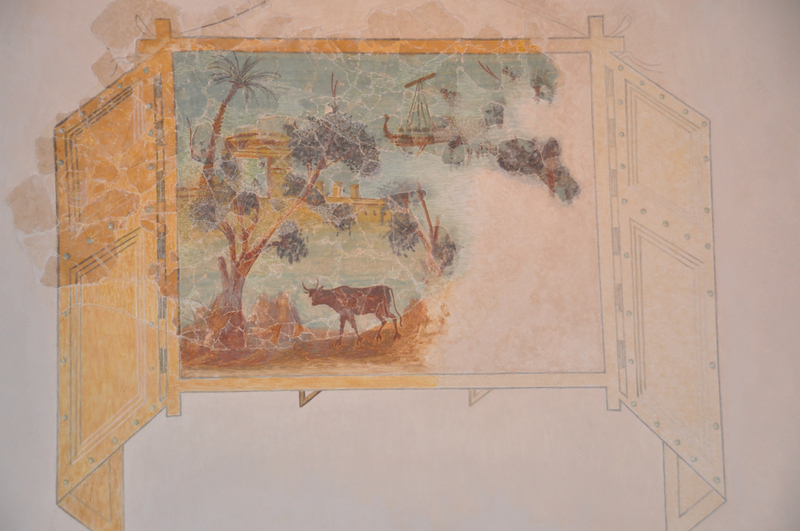 The original frescoes with their intense natural colors were removed from the palace and moved to the museum. So fond of Herod, Augustus had permitted him to mine cinnabar, a red mineral pigment, from his private property in Almadén, Spain. When Marcus Agrippa, Augustus’ deputy visited Judea in 15 BCE, he was so impressed by Herod’s building projects that he sent Roman builders and artists to Judea to contribute their sophisticated skills. Opus recticulatum is a technique for strengthening walls to resist earthquake damage. All three examples of this Roman technique are found in Herod’s projects, discovered by Ehud Netzer: in the palace at Jericho, at the remains of a building north of Damascus gate rumored to be Herod’s Family tomb, and in a section of temple wall at Banias. 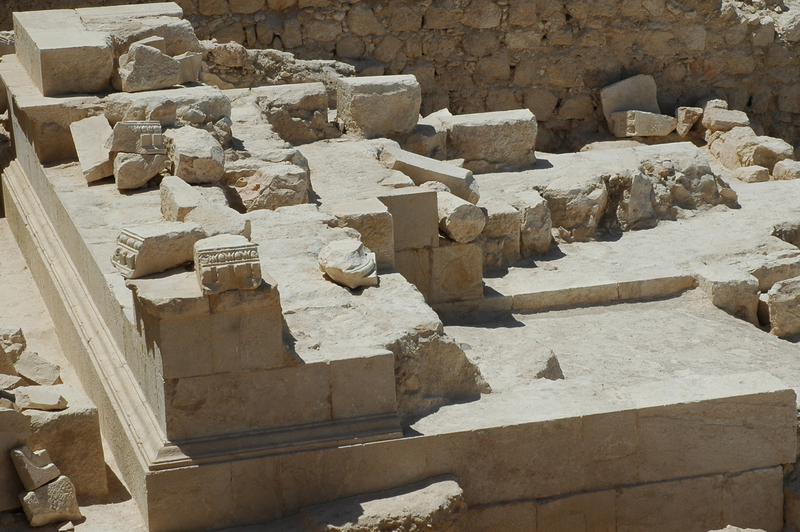 The second room displays Herod’s private stone bathtub uncovered by Netzer at the palace in Cypros. The museum displays floors from Cypros and Herodium laid with a Roman technique, opus sectile. 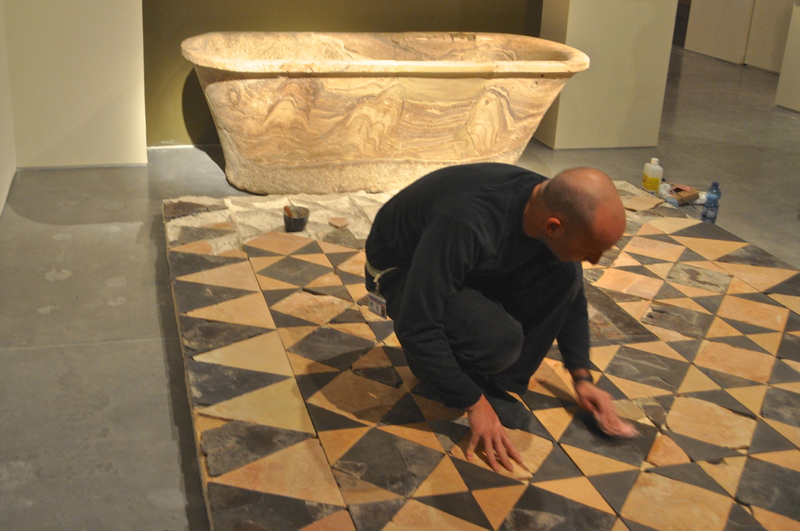 Natural-colored stone tiles are cut in geometric shapes and laid in repeated patterns. In other cases, the floors are mosaic – two mosaic floors from the bathhouse at Lower Herodian, one in an opus sectile pattern and the other geometric shapes with pomegranates. 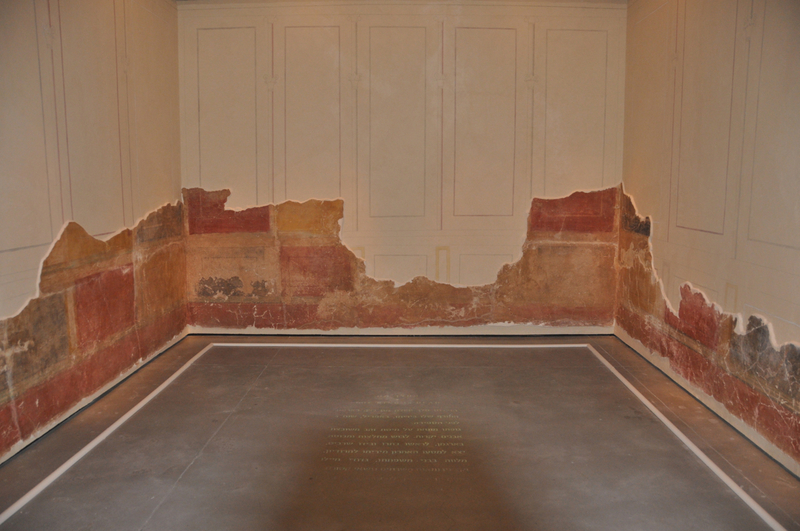 The third room is a reconstruction of the loggia, the VIP box from the Herodium theater with its unique secco wall paintings. According to this Roman technique, paint is added to dry plaster compared with the more usual fresco – fresh, wet plaster technique. These paintings are trompe de l’oeil views of an open window, with wooden shutters, that look out onto a natural scene, at the artistic standard found in the finest palaces and villas in Rome and Pompeii. The exhibit is laid out faithfully to the site at Herodium where the loggia and the mausoleum flank the staircase. At the museum, we move through the viewing platform toward the full life-size reconstruction of the top-level of the mausoleum. The very decorative stones I excavated at Herodium are in their proper places in the frieze. A microchip was attached to each stone of 30 tons that were transported from Herodium to the Museum – as an aid to tracking and assembly. For the same purpose, the Hebrew letter “chet” can be seen on one stone, a sign left by the ancient Jewish stone masons. The structure is so heavy that the floor had to be specially reinforced. In 1982, while Netzer was excavating, he came upon a water cistern in the mountain. He was puzzled that the cistern had been reinforced to support a great weight. Unbeknown to him, he had come within a meter of discovering the mausoleum. Why would Herod have insisted that the mausoleum be built on top of a cistern? According to the curator, Dudi Mevorah, Herod chose this precise location because it is best seen from Jerusalem. Once the mausoleum was complete, Herod dismantled the stage and buried his theater in order not to distract the eye. Netzer drew on his familiarity with Herod’s oeuvre and his expertise as an architect and archaeologist to imagine the mausoleum. Netzer conceives a colossal three-story monument – 25 meters high. The first level is cube-shaped – only the base exists and can be viewed at Herodium halfway up the mountain on the north side. 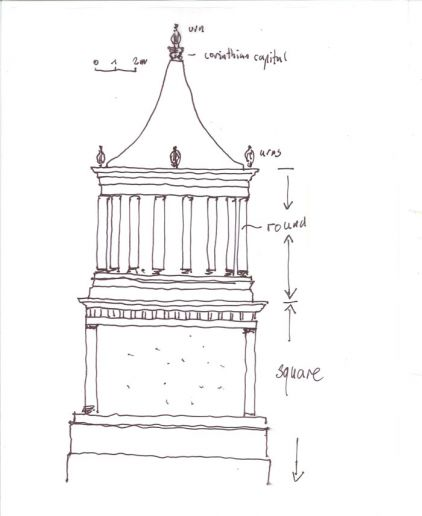 The second level is a tholos, a cylindrical structure with Ionic columns and crowned with a conical roof. 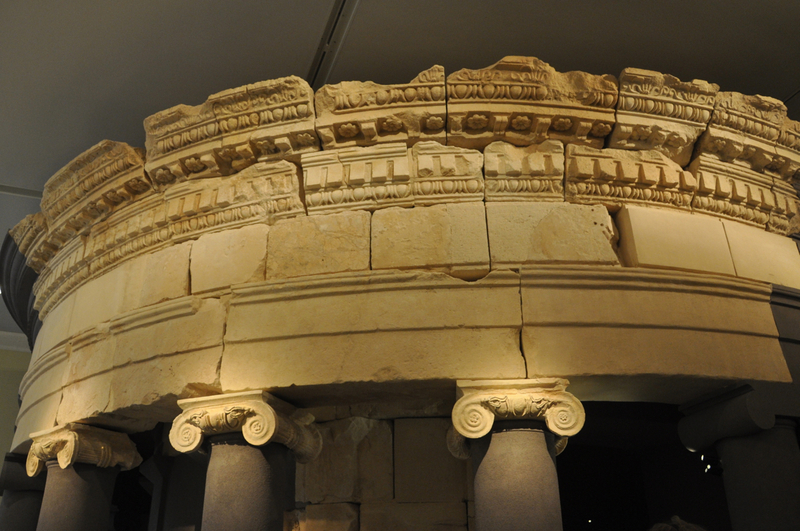 In addition to the Roman style, there are Nabatean elements to memorialize Herod’s Nabatean mother Cypros – two stone replicas of Nabatean funerary urns are on display out of five that adorned the roof. Entering within the structure, the sarcophagus that Netzer claims was Herod’s rests. Netzer found its shards – the stone box had been smashed in antiquity and reconstructed by museum staff. Made of reddish limestone, mizzi ahmar, from the Arabic, this is very hard stone and would have been difficult to carve – perhaps that made it all the more appealing. 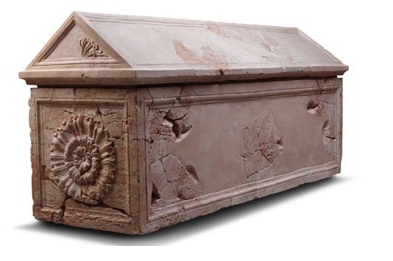 Originally, Netzer suggested that the side panels of the sarcophagus were decorated with five flower medallions. There are sarcophagi like that, one in the Louvre taken from the Tomb of the Kings, one outside the Islamic museum on the Haram el-Sharif. Based on the museum reconstruction, it seems that these panels are plain. Beside the mausoleum, the other two sarcophagi that Netzer discovered are displayed. Netzer posits that these belonged to Herod’s family members. One is decorated with a vine pattern – very similar to the stucco decorations in Herod’s theater box. 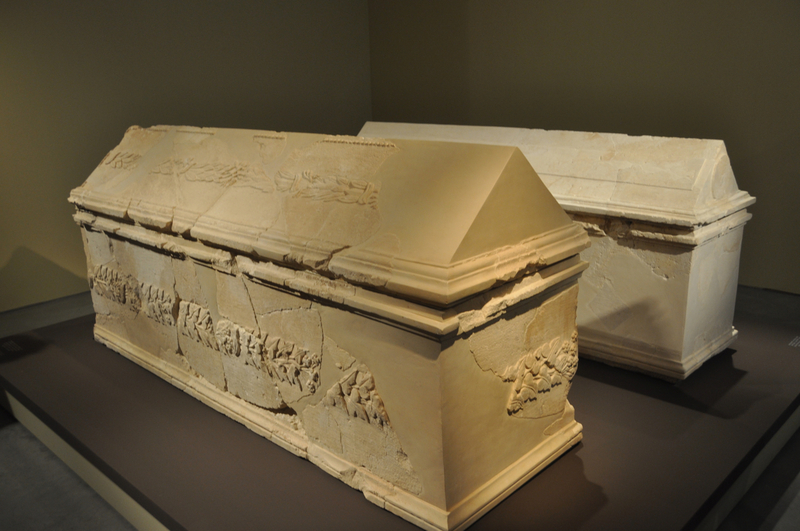 The other sarcophagus, displayed for the first time, is completely plain as if waiting for the stone-carver. 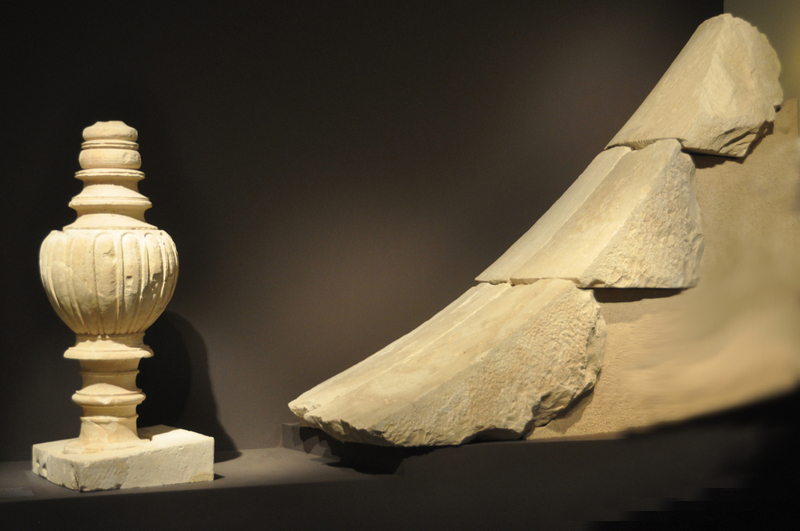 The Israel museum has built a monumental exhibit that expresses Herod’s architecture and aesthetics as discovered by archaeologist, Professor Ehud Netzer – Herod would have been pleased with the result. To understand more requires going beyond the exhibit halls, to experience the drama of Herod’s life in situ, at the sites that Herod built. 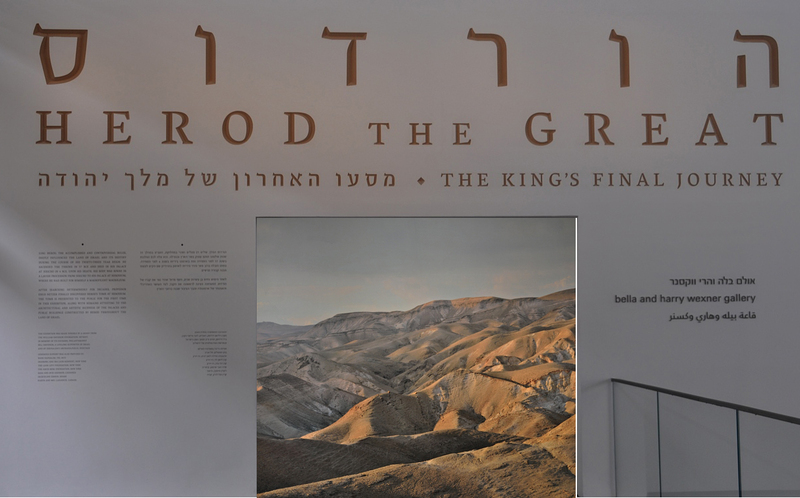 For an in-depth full-day tour of Herodium and the Israel Museum’s “Herod the Great: The King’s Final Journey” exhibit and/or personalized guided tours of Herod’s other sites and more, contact Shmuel. This entry was posted in Archaeology, Architecture, Jerusalem, Museum and tagged architecture, ehud netzer, Herod, Herodium, israel museum on February 13, 2013 by Shmuel Browns.